Increases, decreases, and bands of rhythmic slipped stitches help transform variegated yarn into a beautiful cowl, while still being fun and easy to knit. The Palermo Hat transforms plain 2x2 ribbing into something special with the help of a simple cable. The interplay of light and shadow suddenly creates deep textures and interest. It’s easier than it looks! Miss Babs Keira is delightfully bouncy and calls for a texture you can really snuggle into. The City Paths cowl is designed to make the most of one skein of Keira. Cables, cables everywhere! Stretchy and squishy, this warm winter hat is great in DK and light-worsted weight yarns. Finish it off with a big pompom for even more fun. The Kaweah Hat has texture, rippling cables, and a slouchy look all capped off with a fun pompom. Gradients: these soothing colorways flow gently into one another, giving your knitting a beautiful shaded effect. But sometimes you need to shake up the flow of things with a pop of color and texture. These mittens and fingerless mitts were created to coordinate with the shapes and textures in the Merge hat. Merge is a slouchy beret with a lot of texture. Twisted ribbing, cables, and welts offer lots of places for light and shadow to play on the subtle variations in hand-dyed yarn. Cable decreases create a striking star pattern at the crown of the hat. Brighton is a long infinity cowl that’s perfect for that skein of variegated sock yarn you just couldn’t live without. This gansey-inspired pullover is a sweet way to put a little love onto the little boy or girl in your life. This pattern is knit from the top down in one piece, and the lacy bottom section is easy to lengthen or shorten as desired. Sleeves are knit in the round. 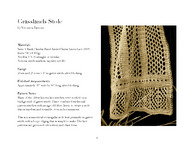 The lace patterns are given both as charts and as written instructions.